The annual Open Repositories Conference is a practitioner based conference that brings together people from higher education, government, libraries, archives and museums to focus on repository infrastructure, tools, services, and policies. The Conference provides a forum for delegates from around the world to explore the challenges and opportunities that arise at the interface of technology and scholarly publishing and practice. open access publications and collections. These projects and communities require different modes of thinking and resourcing than purchasing vended products. While open may be the way forward, mitigating fatigue, finding sustainable funding, and building flexible digital repository platforms is something most of us are striving for. Presentations will be 30 minutes long including questions. Panel proposals are expected to be two to four pages (see below for submission templates). Successful submissions in past years have typically described work relevant to a wide audience and applicable beyond a single software system. All panels are expected to include at least some degree of diversity in viewpoints and personal background of the panelists. Panel sessions are expected to include a short presentation from each panel member followed by a discussion. Panels may take an entire session or may be combined with another submission. Panels can be 45 or 90 minutes long. Discussion Q&A can be 45 or 90 minutes long. The Conference welcomes invite one-page proposals for posters that showcase current work (see below for submission templates). OR2018 will feature physical posters only. Posters will be on display throughout the conference. Instructions for preparing the posters will be distributed to authors of accepted poster proposals prior to the conference. Poster submitters will be expected to give a one-minute teaser to encourage visitors to their poster during the conference. Posters presentations will be 1 minute. Each year a significant proportion of the delegates at Open Repositories are software developers who work on repository software or related services. OR2018 will feature a Developer Track that will provide a focus for showcasing work and exchanging ideas. Building on the success of previous Developer Tracks, where we encouraged live hacking and audience participation, we invite members of the technical community to share the features, systems, tools and best practices that are important to you (see below for submission templates). The 15 minute presentations can be as informal as you like, but we encourage live demonstrations, tours of code repositories, examples of cool features, and the unique viewpoints that so many members of our community possess. Proposals should be one to two pages, including a title, a brief outline of what will be shared with the community, and technologies covered. Developers are also encouraged to contribute to the other tracks. Developer Track presentations are 15 minutes including questions. OR2018 will also again include the popular Ideas Challenge. Taking part in this competition provides an opportunity to take an active role in repository innovation, in collaboration with your peers and in pursuit of prizes. The Ideas Challenge is open to all conference attendees. Further details and guidance on the Ideas Challenge will be forthcoming closer to the conference. The first day of Open Repositories will be dedicated to workshops and tutorials. Please note, the program committee may consider submissions for other tracks and formats, as appropriate. Visit the conference website to get more information about submission templates - Submission System - Review Process - Code of Conduct - Scholarship Programme. Since 2006 Open Repositories has hosted an annual conference that brings together users and developers of open digital repository platforms. For further information about Open Repositories and links to past conference sites, please visit the OR home page. Subscribe to announcements about Open Repositories conferences by joining the OR Google Group. The Open Repositories Steering Committee in conjunction with Universität Hamburg is very pleased to announce that the 14th Open Repositories Conference will be held in Hamburg, Germany from 10-13 June 2019 at Universität Hamburg. Link to online version of this text. The Open Repositories Steering Committee seeks Expressions of Interest (EoI) from candidate host organizations for the 2020 Open Repositories Annual Conference series. Proposals from all geographic areas will be given consideration. 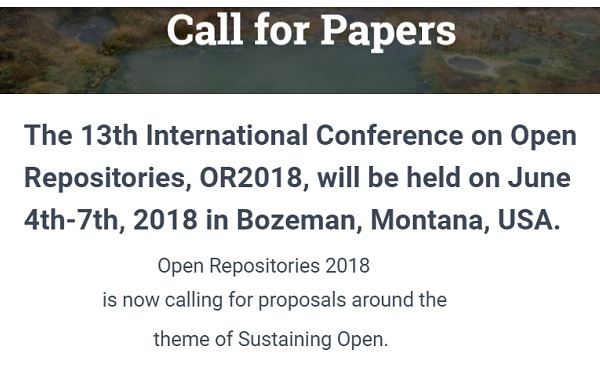 Important dates : The Open Repositories Steering Committee is accepting Expressions of Interest (EoI) to host the OR2020 conferences until February 28th, 2018. Shortlisted sites will be notified by the end of March 2018 and invited to submit a full proposal. Please direct these EoIs and any enquiries to OR Steering Committee Chair Elin Stangeland - elin.stangeland@ub.uio.no. Fuller guidance is provided in the Open Repositories Conference Handbook on the Open Repositories wiki. Get your free copy of Research Data Management Toolkit !